Issues: Complete the Composition section, by adding more info on Kingdom Hearts χ, Kingdom Hearts HD 1.5 ReMIX, and Kingdom Hearts HD 2.5 ReMIX, as well as on the versions found in Piano Collections Kingdom Hearts. "Dearly Beloved" is the opening and main theme to all Kingdom Hearts games. Composed for the first game by Yoko Shimomura, a version of the piece has been featured in every Kingdom Hearts release to date. It begins playing as soon as the game loads and plays over the opening Menu Screen in a loop. However, if one continues to listen to "Dearly Beloved" without pressing any of the buttons on the controller for approximately 10–15 seconds, the screen will open up to Opening Menu Cinematic or Demo Loop, which will play the orchestrated version of the Kingdom Hearts theme song. "Dearly Beloved -Reprise-" is a version of "Dearly Beloved" that plays after the credits during The End. The opening menu of Kingdom Hearts. "Dearly Beloved" plays while on this menu. 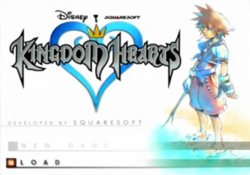 In every game to date, "Dearly Beloved" plays while in the game's opening menu. "Dearly Beloved -Repise-" plays during the ending screen, The End, in every game, as well. In Kingdom Hearts Birth by Sleep, "Dearly Beloved" plays during the special ending, "Blank Points." In Kingdom Hearts coded, "Dearly Beloved -Reprise-" plays during the cutscene "One Last Mystery." In Kingdom Hearts 3D: Dream Drop Distance, "Dearly Beloved" plays during the cutscene "The Duet." In Kingdom Hearts 3D: Dream Drop Distance, "Dearly Beloved" plays during the cutscene "The Apprentice Practices". In Kingdom Hearts 3D: Dream Drop Distance, "Dearly Beloved" plays during the cutscene "Into Sora's Slumber." "Dearly Beloved" contains two distinct melodies comprised out of identical chord structures, allowing them to be layered on top of each other. The second melody was first introduced in Kingdom Hearts Chain of Memories. In Kingdom Hearts, the main melody is performed as a piano solo with a synthesized choral background. The reprise of Kingdom Hearts features a bell solo with pizzicato strings as support. The Kingdom Hearts Chain of Memories version contains the original melody played on the piano, along with the secondary melody played by a synthesizer. The Kingdom Hearts II version transformed "Dearly Beloved" into a full orchestral piece, featuring a piano solo carrying the main melody and various woodwind solos building the secondary melody. The reprise of the Kingdom Hearts II version contains both melodies, but played as a piano solo. Kingdom Hearts 358/2 Days contains a nearly identical version of the Kingdom Hearts II "Dearly Beloved" reprise, only this time it has the flute used in "Roxas' Theme". Kingdom Hearts Birth by Sleep features a new orchestral arrangement of "Dearly Beloved", still featuring a piano as with the previous games but including a violin solo featuring a third theme exclusive to this game. Kingdom Hearts Birth by Sleep is the first game to change the chord structure of Dearly Beloved, albeit briefly. Kingdom Hearts Re:coded contains a slightly faster version of the original Dearly Beloved theme. It features both the first and second melodies, with pizzicato string support. Kingdom Hearts 3D: Dream Drop Distance contains a version of "Dearly Beloved" that retains the original theme with pianos, violins, glockenspiel, and plucked violins, then the melody is played with flute and then has a slightly quicker, waltz-like part where a tambourine comes into play. Unlike other versions, it also switches between a 4/4 and 3/4 time signature - a reference to the "3D" in the title according to Yoko Shimomura. The arrangement of Dearly Beloved in Kingdom Hearts III is a piano concerto. Tetsuya Nomura ordered it to be based on the Transcendental Études, a series of twelve compositions for piano by Franz Liszt. The melody in the introduction of the piece is different from any of the arrangements prior until it reaches the moment where it becomes its usual melody. The themes "Friends in My Heart", "Always on My Mind", "March Caprice for Piano and Orchestra", "Fantasia alla Marcia for Piano, Chorus, and Orchestra", "Birth by Sleep -A Link to the Future-", and "Dream Drop Distance -The Next Awakening-" contain or are variations of "Dearly Beloved". "Musique pour la tristesse de Xion", the character theme for Xion, "A Fight to the Death", the second battle theme for Xemnas, "Dearly Dreams", the field theme for the Mirage Arena in Kingdom Hearts Birth by Sleep, also contains the main melody from "Dearly Beloved", as does "The Key", the battle theme to Ventus-Vanitas. Most recently, "Link to All" and "Sacred Distance" from Kingdom Hearts 3D: Dream Drop Distance centers around the main melodic theme from "Dearly Beloved". 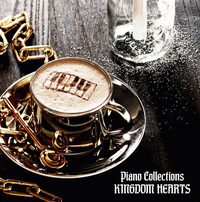 Piano Collections Kingdom Hearts contains the official sheet music. Disc 1, Track 1 in the "Kingdom Hearts 10th Anniversary Fan Selection -Melodies & Memories- Soundtrack"
Disc 1, Track 12 in the "Kingdom Hearts 10th Anniversary Fan Selection -Melodies & Memories- Soundtrack"
Disc 2, Track 1 in the "Kingdom Hearts 10th Anniversary Fan Selection -Melodies & Memories- Soundtrack"
Disc 2, Track 6 in the "Kingdom Hearts 10th Anniversary Fan Selection -Melodies & Memories- Soundtrack"
Disc 2, Track 13 in the "Kingdom Hearts 10th Anniversary Fan Selection -Melodies & Memories- Soundtrack"
Disc 1, Track 1 in the "Piano Collections Kingdom Hearts Soundtrack"
Disc 1, Track 12 in the "Piano Collections Kingdom Hearts Soundtrack"
This page was last edited on 3 April 2019, at 17:11.